The RAAF, after a year-long investigation, have admitted that Australian Super Hornets “may have” killed an estimated 18 civilians in Mosul in Iraq. The announcement on February 1, by Air Marshal Hupfield, was in damage control mode. The airmen were not to blame, the Iraqi soldiers were not to blame as they under fighting stress, and most of all the Coalition forces were not to blame as they gave the right target coordinates. With suitable sad face Hupfield announced “this was an unfortunate consequence of war”. 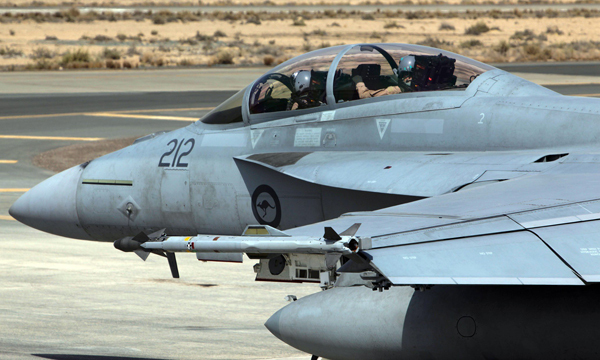 Australian Super Hornets “may have” killed an estimated 18 civilians. However, a survivor of the attack says the Australian bomb destroyed her house, killing 35 members of her family. Airwarfare, an NGO that monitors coalition bombing in the Middle East, says those killed numbered 35 with 18 more injured. There is an obvious mismatch between the information from the Australian Government and that from independent observers. Based on past experience, the survivor and NGOs are likely to be closer to the truth than the ADF. The RAAF has been less than honest in the past, the AABCC says. One incident was reported on the ABC’s 7.30 Report in March 2017. The RAAF was exposed as being the most recalcitrant of military services in providing co-ordinates of bombing missions to human rights organisations. Australia’s intransigence contrasted strongly with even the US and NATO states. Another pointer to the ADF’s duplicity is the fact that the commander of the operation that resulted in the civilian deaths was awarded a Distinguished Service Medal in the 2019 Australia Day Honours. The citation read in part that he protected “civilians in proximity to the fighting”. “Royal Australian Air Force members who were recognised in the Australia Day Honours served their country with distinction in a demanding operational environment, and have been recognised accordingly.” We say in fact they brought shame on us. The February 1, 2019 statement is a continuation of the ADF’s policy of not providing information to the Australian people on a range of issues relating to its operations. In view of the exorbitant amount of money provided by the Australian taxpayer for ADF operations, the lack of information is scandalous. Both the government and the ADF are responsible for these deaths as they decided to take part in yet another US dirty war.